Yamaha has broken its silence about the MT-10 after keeping its cards close to its chest since November when it was first unveiled. Milan was the setting for the latest and most powerful MT’s debut and it generated lots of buzz when it made it on stage. That’s hardly surprising, given the success of the MT-09 and MT-07 in the UK but interest is sure to peak again after the Japanese manufacturer revealed technical specifications for the MT-10 this week. It boasts 158.2bhp towards the top of the rev range and puts out almost 82lb-ft of torque. That’s combined with a weight of 210kg and multiple features from the YZF-R1 sportsbike that hit dealerships in 2015. The main chassis, suspension and engine has been taken from the R1 and retuned to give a bit more grunt in the middle of the rev range. While the exterior has been stripped back and the fairings ditched, the electronics onboard the MT-10 are comprehensive. Yamaha has added its Slip & Assist clutch features as well as different rider modes, traction control and cruise control. A number of add-on options will also be available at launch, including heated grips and a quickshifter. 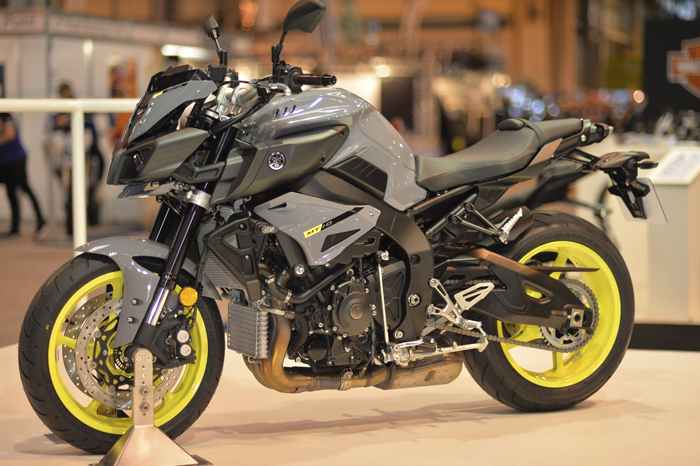 The Yamaha MT-10 motorcycle will cost £9,999 when it arrives at UK dealerships in May. In terms of price, that’s slap bang in the middle of the likes of the SMW S1000R and Triumph Speed Triple at the top of the naked segment. Read our honest motorcycle owner reviews for the MT-07 and MT-09 and see what they’re like to live with.